Changing the oil an seals in your fork is not necessarily an easy job, but something you'll probably have to worry about sooner or later. When the seals start to leak, you can sometimes clean the area around the seal, and under the seal to get any grit out that may be wedged in between the seal surface and the fork. Motion Pro makes a "tool" to do this called the "seal mate". It's a thin plastic piece than can reach under the seal and clean it. Eventually though, the rubber in the seal will stiffen and/or wear out and start to leak. First, back off the rebound and compression adjusting screws all the way, or the softest setting(on the fork cap for compression and the end of the bottom fork lug for rebound), counting the number of clicks so you can set them back when the time comes. Now, loosen the outer cap nut on the top of the fork leg(shown below), I used a Tusk Fork Cap Wrench 46/50mm - 2001 Honda CR250R, Part # 1143530001. This can be easier to loosen while it's still mounted on the bike, it wouldn't fit between the nut and handlebars on mine. Soft jaws on the vice are a must for this project. On 1998-2001 model CR250, it is a 50mm nut. Slide the slider down and dump the oil out of the outer fork tube. Then temporarily thread the cap back on hand tight for the next step. 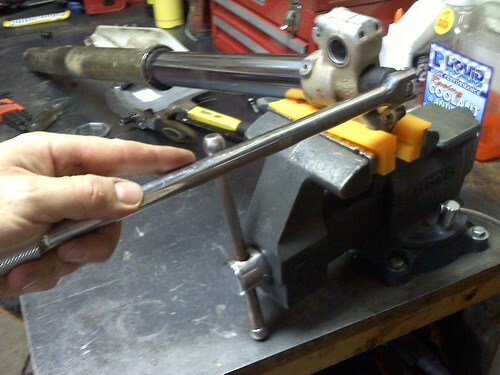 With the center bolt loosened all the way, push on the fork cap to extend the center bolt and damper rod from the axle holder, then install the stopper tool between the axle holder and locknut as shown in the youtube clip. Part # 1283810001, but this tool can also be made from a piece of aluminum if you have the time and means to do so. The slot should measure 1/2 inch(12.2mm) wide, and about an inch deep. 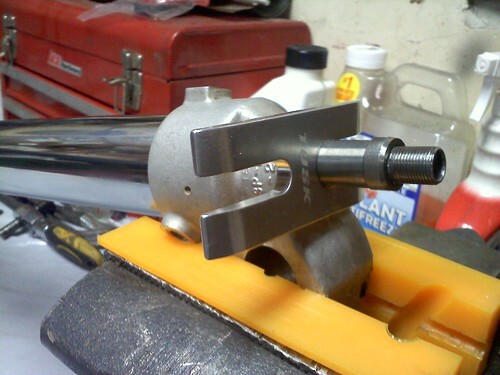 With the stopper/holding tool in place, back the center nut off the lock nut and remove the center nut and pushrod. 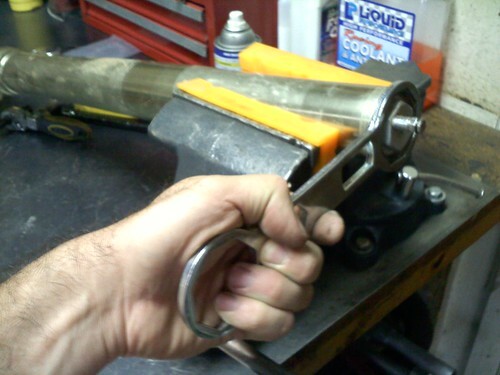 Romove the stopper tool. 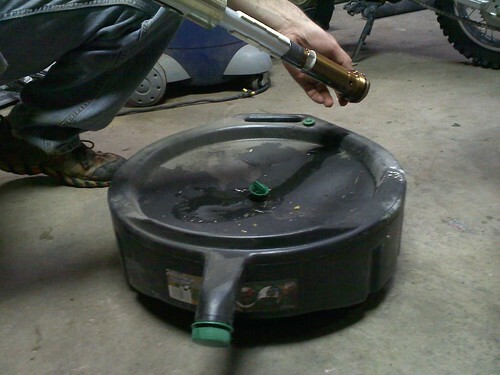 Then remove the inner fork cap assembly and dump the oil out of the inner cartridge. Now pry the slit in the upper bushing apart to remove it. 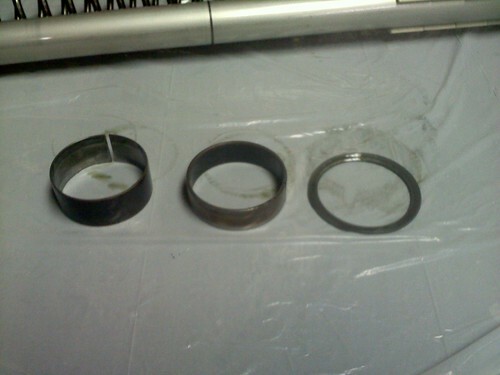 With the upper bushing removed, the lower bushing, oil seal, oil seal retaining ring, and dust seal can be removed. Inspect the bushings to see if the outer coating has been damaged. If they are damaged, replace with new bushings. Lay down on the table in the order and orientation they came out. Now it's time to install the new seals and refill with new oil. Install the new dust seal first. A seal bullet or a piece of a plastic bag should be put over the end of the fork tube to cover up the ridge so the seals do not get damaged as you slide them on and over the ridges. After the dust seal, the oil seal retaining ring, the oil seal, the washer, the lower bushing and finally, the upper bushing should be installed. Next use a seal driver to seat the washer and lower bushing, then use the same seal driver so seat the oil seal(shown below). 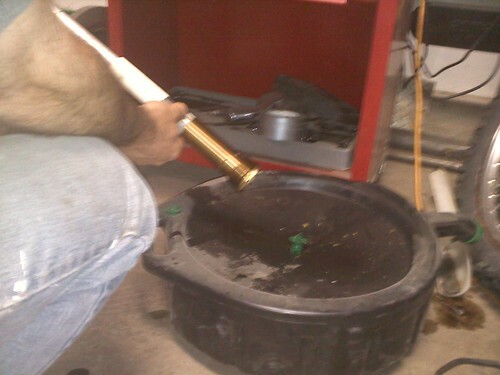 With these seated, install the oil seal retaining ring and the dust seal by hand. Now you should fill the inner cartridge with oil. The Honda 97 to 2001 CR250 requires 180cc of 5W fork oil in the inner cartridge. With the inner cartridge in the soft jaws, pour the oil in, then pump the damping rod a few times slowly to remove any air. Now, with the damper rod extended install the inner fork cap assembly, push the cap on and tighten it down. With the inner cartridge containing the correct amount of oil, it can now be installed along with the spring and washers back into the outer fork tube. Make sure you install them in the order they came out. First go the washers, then the spring, then the cartridge. Now thread the inner cartridge into the outer tube(temporarily). You'll now use the stopper tool again as shown below, pushing on the fork cap down and sliding the tool in to hold it in place. 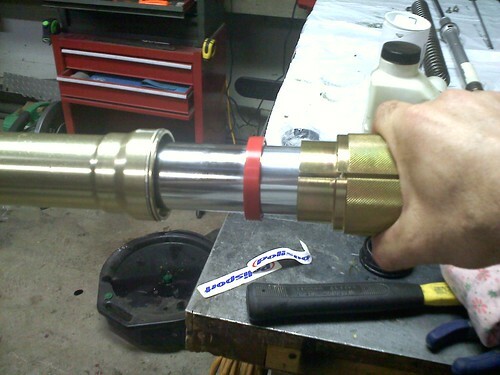 At this point you'll want to turn the lock nut all the way in towards the stopper tool on the threads as shown below. There should be .59-.62 in. of thread showing. Now, install the damping rod and center bolt that were removed before. 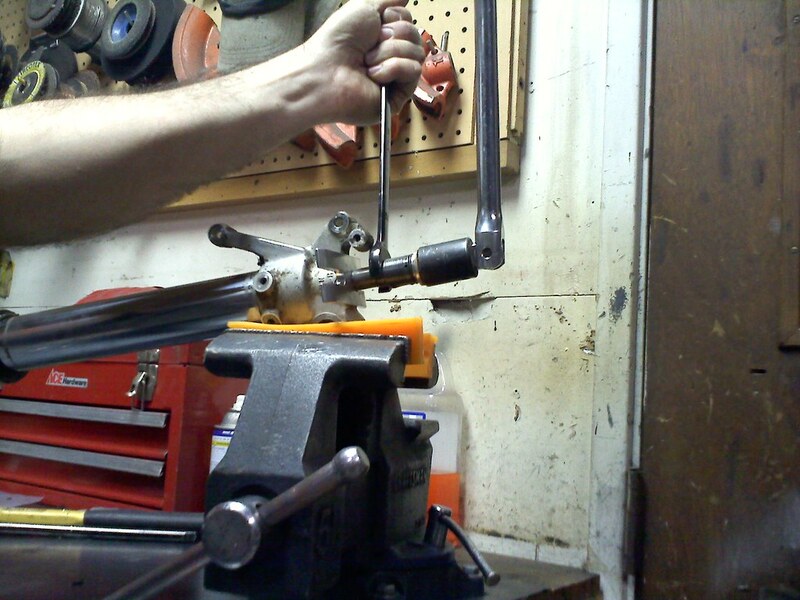 Turn the center bolt all the way in until you feel it lightly seat. There will be a small gap between the center bolt and lock nut once the center bolt is fully seated. Use a socket and open end wrench,(the same way you use to take them apart) to tighten the lock nut against the center bolt. 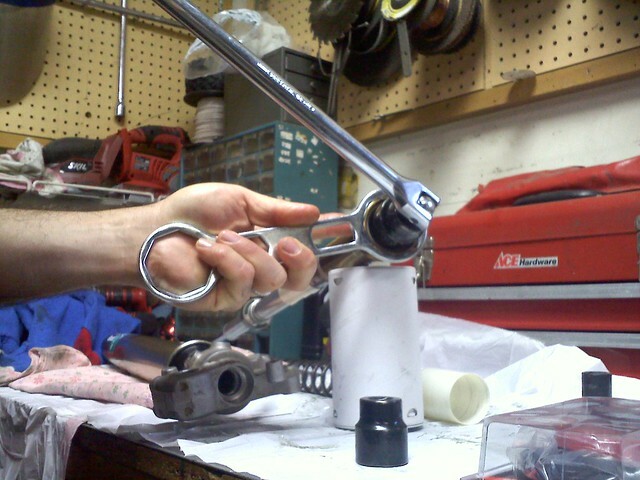 Now remove the tool and thread the center bolt into the fork lug and tighten it up. Set your rebound back to where it was. Mine was 14 clicks out from all the way seated. 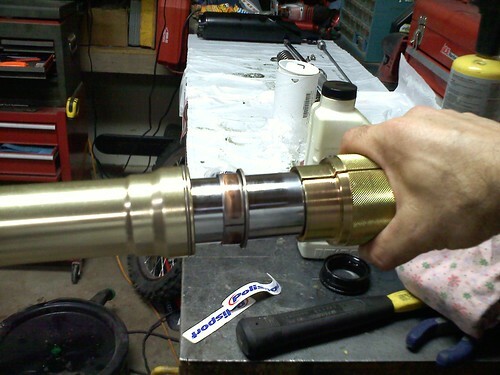 Now you can loosen the cap from the outer fork tube again, and add oil to the outer fork tube. Slide the outer tube down a bit, tip the fork assembly at a 45 degree angle and pour in the oil. Refer to your owners manual for the correct amount and type of oil. For a 2001 CR250, use 383cc of 5W fork oil for standard with a max of 433cc and a minimum of 377cc. Now slide the outer tube back up into place, tighten the cap on and install the fork back into the triple clamp on your bike! Here are a couple of very good video guides on another model bike for the same dual chamber style fork. Great info - keep up the great work. Very informative information with great videos. Good how-to. mine wasn't bad, I think I got lucky. :) Good luck! Is it bad if the guide bushing slides in? The first one had to be pounded in using a seal driver. I think it'll leak, being that it just slides in. Any help is appreciated, thanks!